Since the publication of this book�s bestselling predecessor, Mathematica� has matured considerably and the computing power of desktop computers has increased greatly. The Mathematica� typesetting functionality has also become sufficiently robust that the final copy for this edition could be transformed directly from Mathematica R notebooks to LaTex input. 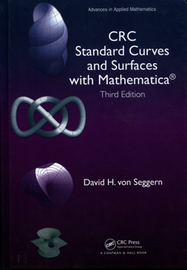 Incorporating these aspects, CRC Standard Curves and Surfaces with Mathematica�, Third Edition is a virtual encyclopedia of curves and functions that depicts nearly all of the standard mathematical functions and geometrical figures in use today. The overall format of the book is largely unchanged from the previous edition, with function definitions and their illustrations presented closely together. The book presents a comprehensive collection of nearly 1,000 illustrations of curves and surfaces often used or encountered in mathematics, graphics design, science, and engineering fields. One significant change with this edition is that, instead of presenting a range of realizations for most functions, this edition presents only one curve associated with each function.